GRAND RAPIDS, Mich—”It was delightful!” said teacher Barbara Barry after seeing Shen Yun Performing Arts at the De Vos Performance Hall on Feb. 15. 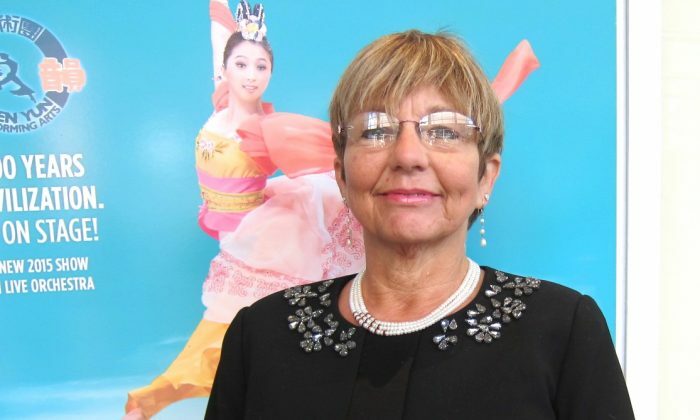 Ms. Barry said her only regret was not attending Shen Yun on Saturday as well, as she found the show so compelling, she would have come both days. “For 5,000 years divine culture flourished in the land of China. Humanity’s treasure was nearly lost, but through breathtaking music and dance, Shen Yun is bringing back this glorious culture,” according to the company’s website. Having taught ancient history, Ms. Barry appreciated the depth of the performances and noted one dance which referred to creation [Following the Creator to Renew All Things]. She said, “Human beings need to have a higher presence … Every civilization had a creation story.” She called the performances astounding. Some of Shen Yun’s classical Chinese dances tell of ancients legends, others are spiritual and take place in modern day China. Some are about Falun Dafa, a meditation practice that emphasizes truthfulness, compassion, and forbearance.